Halo: Reach Covenant Are "Terrifying"
With the upcoming Halo: Reach, Bungie was given the chance to reimagine its Covenant baddies as something truly "terrifying," says the game's executive producer. It's no secret to anyone who played the Halo trilogy that the Covenant ceased to be all that intimidating or scary as soon as the mindless, relentlessly infectious Flood first showed up in "343 Guilty Spark" in the first game. The Flood were silent as they swarmed over you like a... erm, flood, while the Covenant roared and got frustrated or ran away squeaking in terror when shot at (depending on what type of enemy you were facing). And then, in Halo 2 and Halo 3, you got to play as the Covenant - or the Arbiter, anyway. 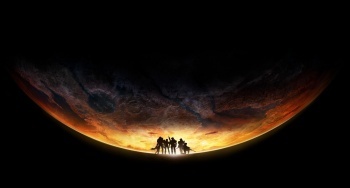 But that's going to change in the prequel Halo: Reach. There's no Flood, no Forerunners, and no Halo installations, just the Covenant on their drive to exterminate humanity - and that is going to provide a springboard for Bungie to reimagine their original villains as something scary and intimidating. According to a 10-page spread on Halo: Reach in this month's issue of Official Xbox Magazine UK, Bungie executive producer Joseph Tung says the developer wanted to make the Covenant something that players would really be intimidated to go up against. "We wanted to reintroduce a more terrifying Covenant," said Tung. "We wanted, especially in Covenant weaponry, something much more violent and visceral." Beyond just weaponry, Reach will add new Covenant races like the Skirmisher, a fast and nimble enemy that OXM describes as looking similar to the birdlike Jackals. Of course, the game will likely offer no explanation why said Skirmishers are completely missing from any of the games in the series that take place chronologically after Reach (which, at last count, is all of them). The perils of making a prequel, I guess. It's all well and good, and I applaud what Bungie is trying to do, but can you really make Grunts scary? At all? I don't think so, Tim.